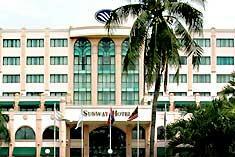 Sunway Hotel is located in the heart of Phnom Penh’s green belt that is home to the capital’s most prestigious addresses, surrounded by many famous Cambodian landmarks, government offices, and embassies reflecting the country’s history. The Executive Suites at this property are like apartments with kitchenette for cooking in if that is your pleasure. However, the dining here in the hotel is quite good with a surprisingly vast selection of international and Cambodian cuisines. This hotel caters primarily to business travellers so there is a fitness center but there is no swimming pool. The hotel is just two minutes from the popular Wat Phnom Pagoda, from which Phnom Penh derives its name, and an equal distance from the Mekong River and Sorya Shopping Mall. Sunway’s 138 well-appointed guestrooms and suites combine modern facilities and amenities on top of offering unparalleled views that reinforce the hotel’s pride of place amidst a beautifully-landscaped boulevard and the city’s historic skyline. Directly across the boulevard is the United States Embassy and the central location makes it very convenient for getting around to wherever you want to go in the capital city. The train station is a ten-minute walk from the hotel and the airport is 20 minutes away by car. The non-smoking guestrooms here are really clean and comfortable with large bay windows and flat-screen televisions. The Executive Suites are tastefully furnished one-bedroom accommodations equipped with all the necessities to make travelers feel comfortable, including kitchenette and dining area, bedroom, and balcony. Your private balcony presents splendid views of the landscaped boulevard, the city’s historic skyline and the majestic Wat Phnom Pagoda. The affable hotel staff extend the comfort of your stay to every interaction you experience with them. The breakfast buffet is excellent and for your other meals there are three dining options on the premises; Sun Cafe, Lobby Lounge, and Deli Shop. Guests are invited to exercise in the hotel fitness center and relax in the Jacuzzi hot tub, sauna and spa facilities where you should definitely try a traditional Khmer massage. 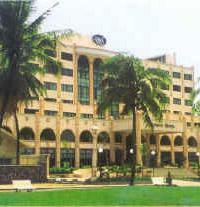 The hotel front desk can help you with any sightseeing arrangements and transportation needs. 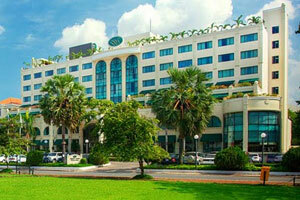 There is a car rental service available and the hotel provides free parking for guests.